I wrote back in November about my iphone with its cracker jack prize of a camera. I very rarely use the camera on my iPhone 3G. There’s all of one photo on Visions I took with the phone, a shot of my Dear Secretary Jayne. Sunday afternoon my wife and I travelled to north Knoxville to welcome back my father to his home after his almost month long stay in a hospital in Atlanta and a Knoxville transitional care unit. 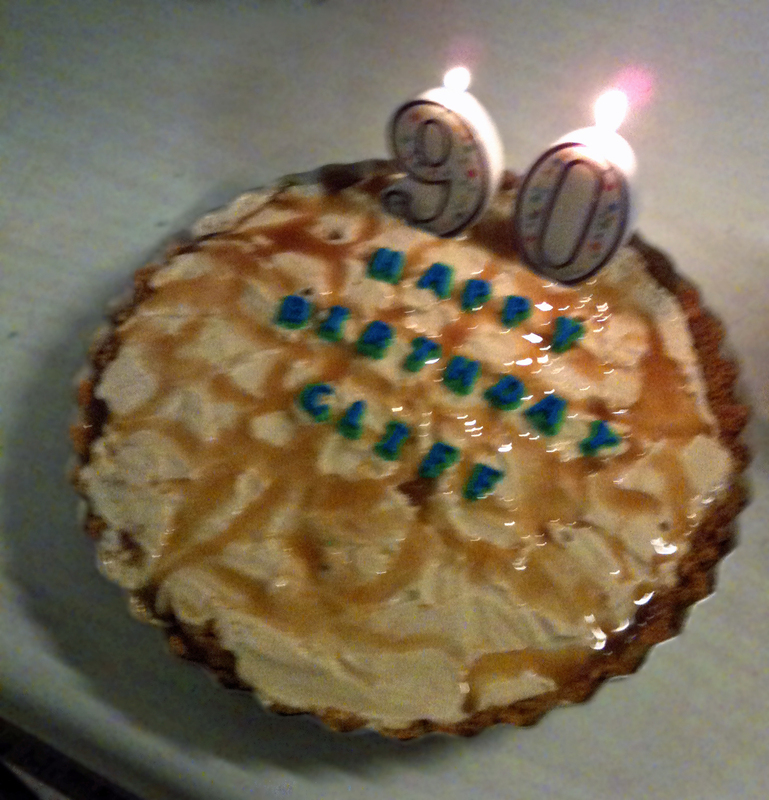 We also went to celebrate, two days early, his ninetieth birthday. We (which of course means my wife) made him a birthday cake and brought a token present: a pair of lounging pajamas. My wife caused me considerable heartburn when, through her office, she got a iPhone 3GS. The worst part is she only uses it as a phone and could care less about all those neat features that, sob, are not on my antique 3G. 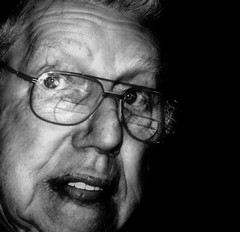 Here is a Flickr group of over seven thousand photos taken with the iPhone 3Gs. 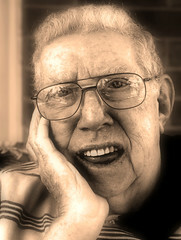 Next week my father will celebrate his ninetieth birthday. Sadly, he won’t be able to do much celebrating. Over the past six months his health has been precarious. Today he is in a transitional health care unit in Knoxville after spending two weeks in Emory Hospital in Atlanta throughout the Christmas vacation period. Like most people, I have uncounted memories of my father, both good and bad, made from my earliest childhood through today. In those memories he ages from his early thirties onward. Our relationship, particularly in my late teens and early twenties, has been strained at times. I decided twenty years or so ago to make peace. I did not want to have our relationship remain contentious to the bitter end. He was, after all, my father. I was bound to him as surely as I was bound to my own heart. He was a part of me, of my life, I could never escape. “You’re just like your dad,” was an accusation or compliment I heard more and more often as I aged. I don’t have a lot of photographs of my father. 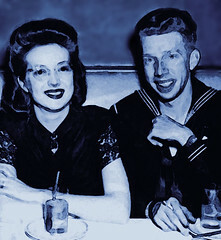 The sketch of him was done by his sister when he was in his thirties, and the photoshopped photo of my parents dates from shortly after they married. 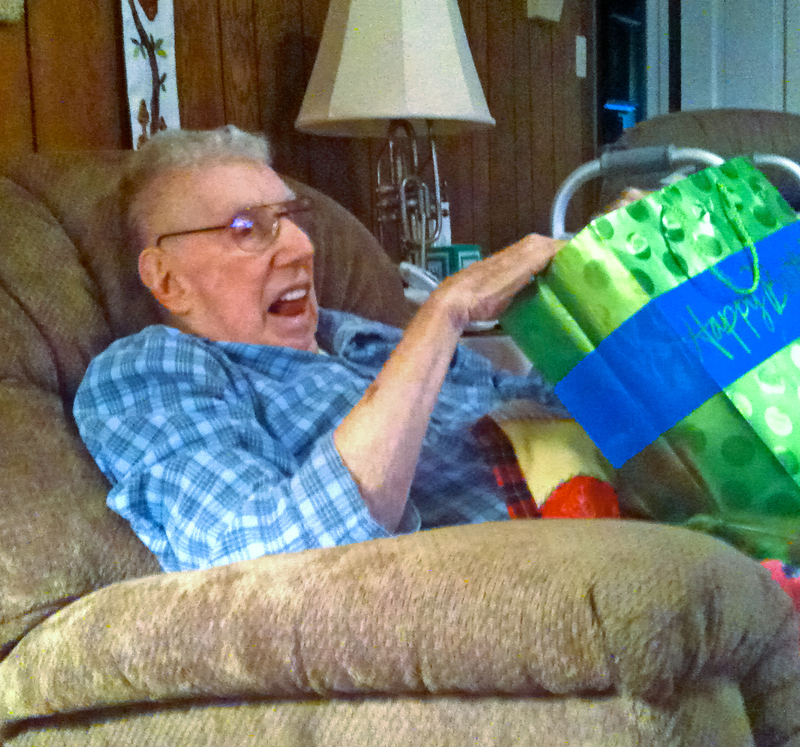 I’ve also included two of my better photos of dad taken recently…. I’ve lived in or near Knoxville, Tennessee, most of my life. My family moved to the city from Anderson County when I was five. My parents bought a brand new house in a brand new subdivision in the west edge of Knoxville. We moved to California when I was around twelve, then came back in the summer before my freshman year in high school (some of my California adventures are recounted here and here). Once called a “scruffy little city” by a national magazine, Knoxville now is reasonably civilized. When I was young the city was consumed by arguments over fluoridation of the water supply, racial integration, and whether Earl Warren should be impeached. I’ve since seen the arrival of fluoride, relative racial equality and, alas, a conservative Supreme Court. I’ve applauded the coming of live theater, a decent symphony orchestra, and legal liquor, both package stores and by the drink, and the subsequent rise in sophisticated and varied dining. I even survived the very mixed blessing that was the “world’s fair” in 1982. Most of my post high school education was in Knoxville, concluding with law school. During the late sixties I was a minor player in the anti-war (that’s the Vietnam War) movement at the university. I freely admit the severe character flaw which causes my baffling addiction to all university sports teams and my illogical love for a certain shade of orange, particularly on autumnal Saturday afternoons. Being the insufferable liberal elitist that I am, I’ve always yearned to live in a much larger, more cosmopolitan city. New York would be the best. Chicago would be good. Atlanta would do in a pinch. But Knoxville is like family to me: I may have decideally mixed feelings about the city but I can’t seem to get very far away from the place.